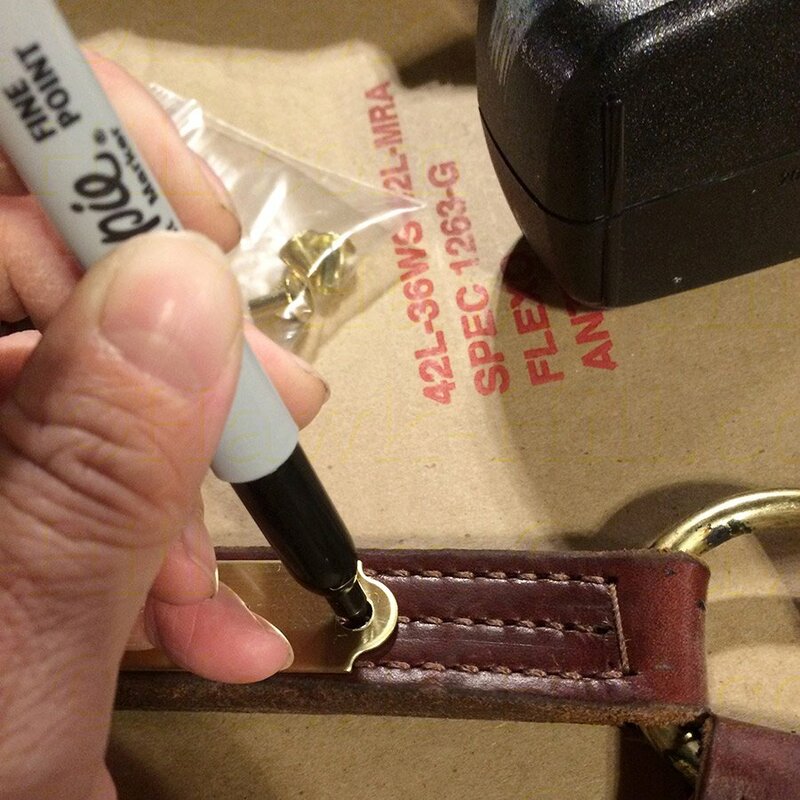 Step by step instructions for attaching an engraved metal plate to a leather strap (halter, belt, etc) WITHOUT using a leather punch or rivet setting tools. 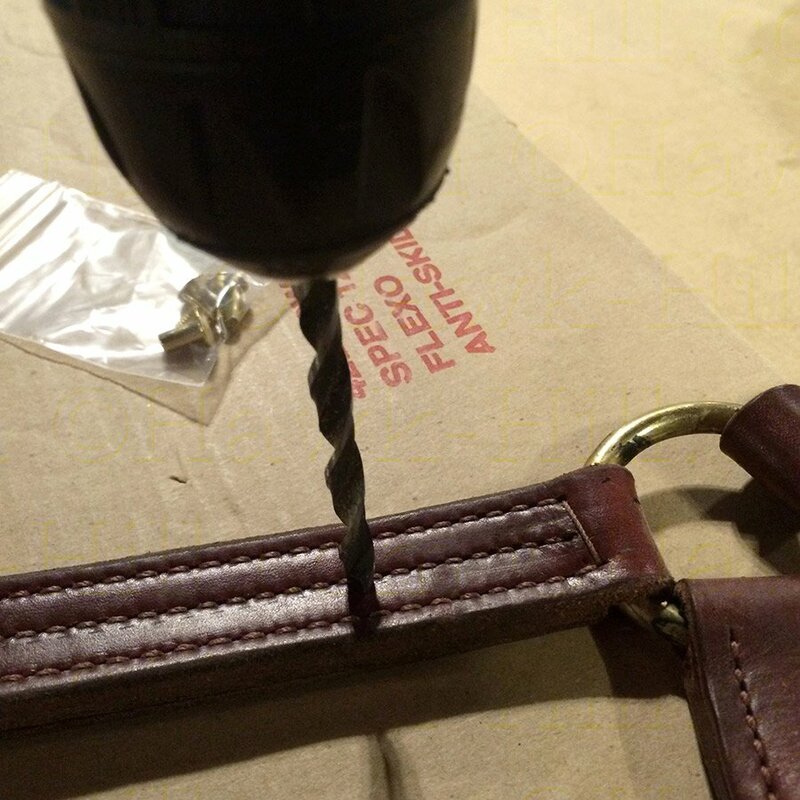 Using tools from a standard toolbox, I’ll show you how to attach metal plates to strap goods. Frustrated by the typically huge price difference between buying an item that ships with an engraved plate attached vs. buying a plate separately, I prefer to buy engraved plates loose and attach them myself. 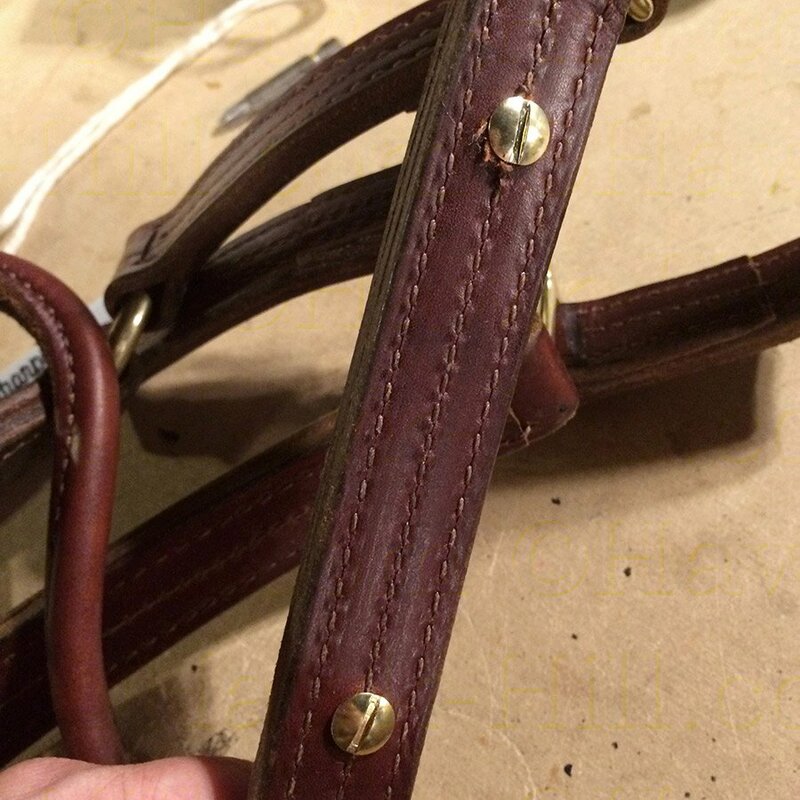 When a manufacturer or sometimes tack store attaches your engraved plate for you, they typically use rivets- permanent metal fasteners that cannot be removed. When you attach metal plates yourself (or sometimes if you ask specifically when having an engraved item made) you can use Chicago Screws. 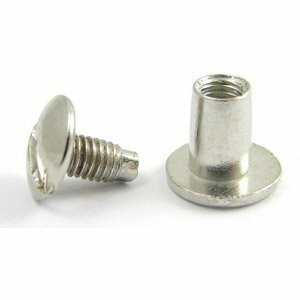 Buy Chicago Screws in various colors and sizes here. Chicago Screws function like removable rivets- so you can remove or switch engraved plates as needed. 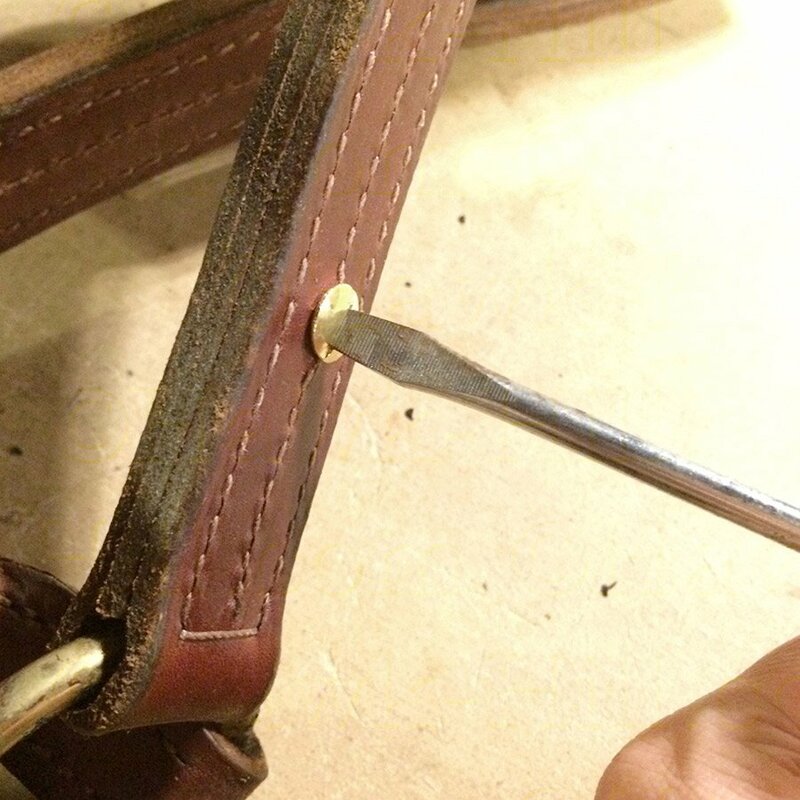 Once holes have been made in your halter, only a screwdriver is needed to attach, remove, or swap plates between halters. 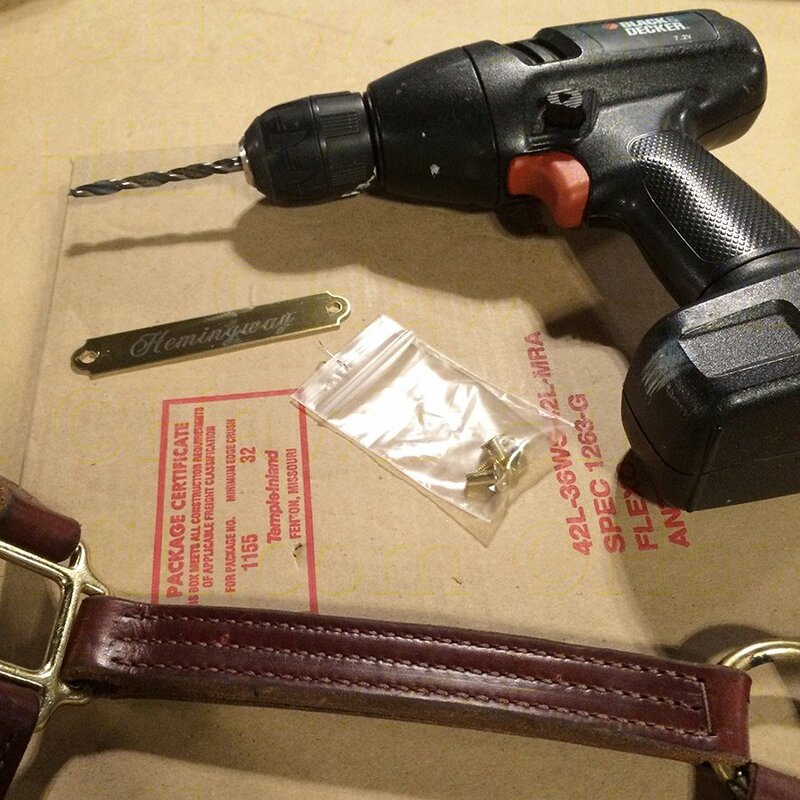 This is helpful when a halter breaks (for example, when your horse pulls back two days after getting a new engraved halter… not that that would ever happen to any horse owner. 😉 or when a horse is sold and you don’t want to sell the halter they’re wearing. 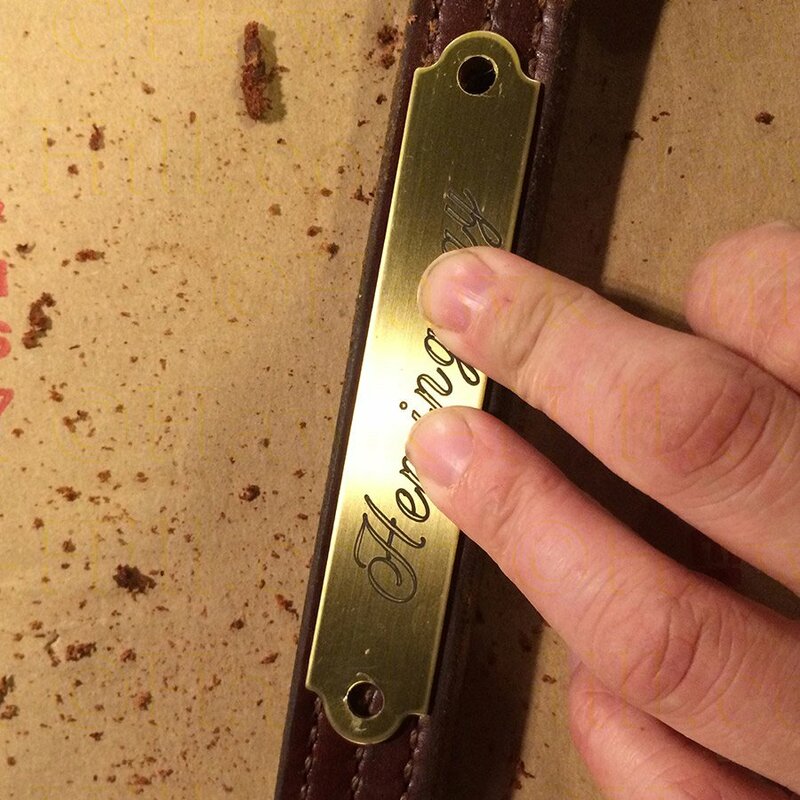 Step 2: Place engraved plate over strap, and align where you’d like the plate to be permanently. Step 3: Use a marker to mark where holes should be made. I recommend moving the marker in a circle around the hole, rather than placing a dot in the center, as the circle makes it easier to align your drill in the next step. Step 4: Remove plate and set aside. 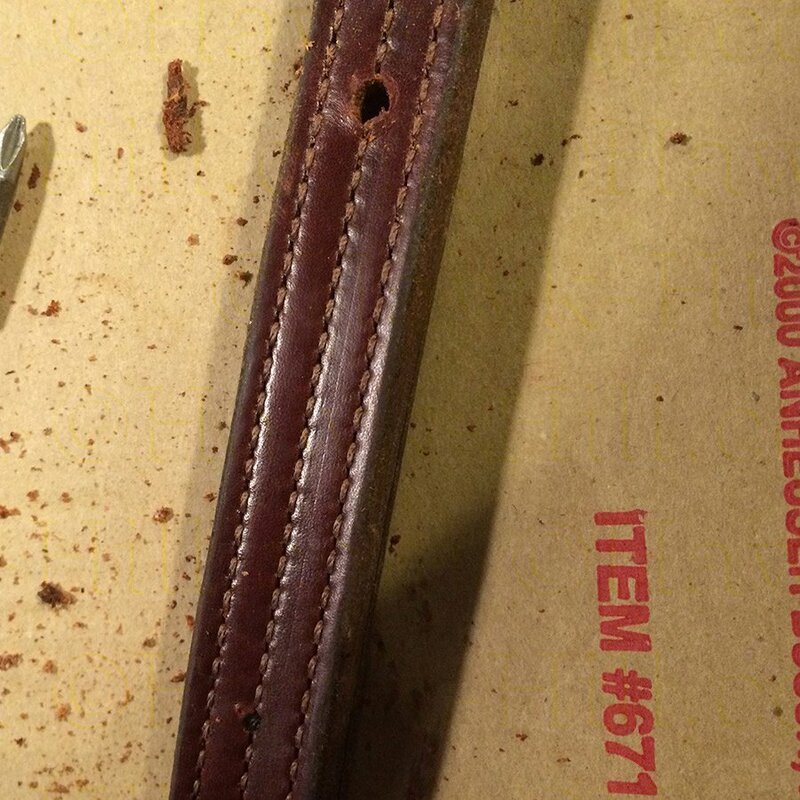 Use drill bit to drill through the leather. 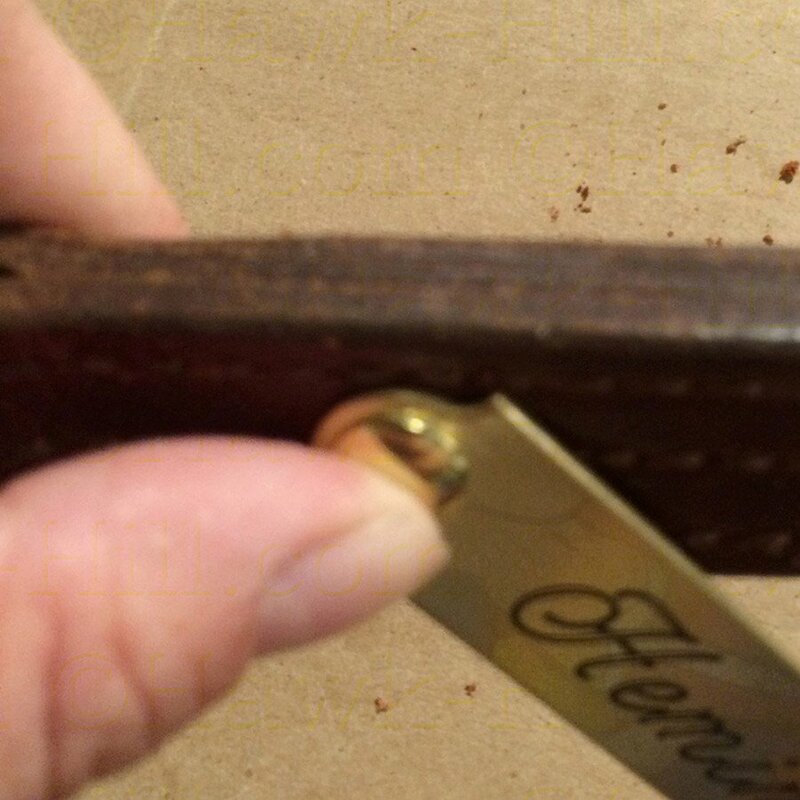 (This step works best if the leather is cold and not overconditioned) A wood bit with a spur point seems to work well and the sharp tip prevents the drill from moving off the center point mark. Step 5. Before drilling the second hole, align the engraved plate over the first hole and reconfirm that the second marking is still aligned correctly. Double checking is always worth it, friends! Step 9: And, using your fingers, screw the screw post in from the other side. 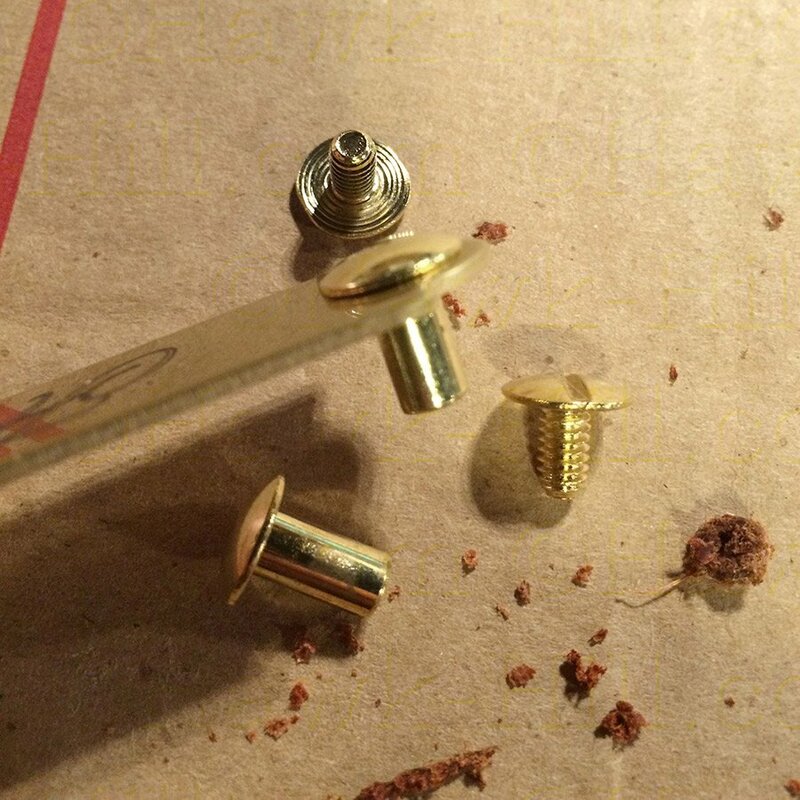 Step 9: Attach the plate with both screws, loosely. Step 10: Tighten with a flat head screwdriver. 2 HINTS: #1. add a drop or two of superglue to the threads to prevent accidentally loosening. #2. To tighten, place a rubber band over your thumb and then your thumb over the smooth cap side of the chicago screw as you tighten. 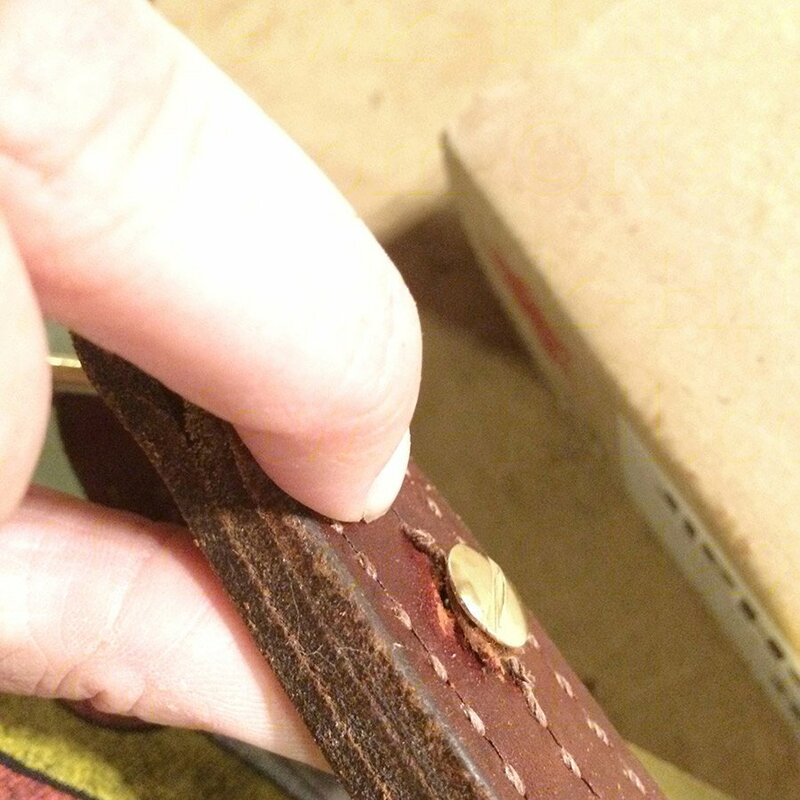 The friction added by the ribber band will help get the screw extra tight. Project Complete! 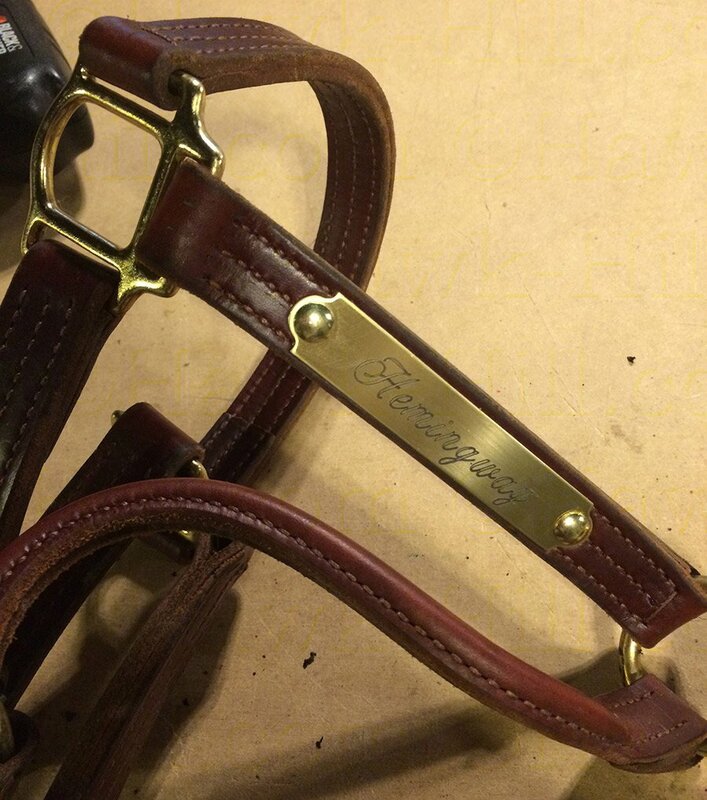 Once you have the supplies, adding and swapping engraved halter plates as needed is quick and easy! 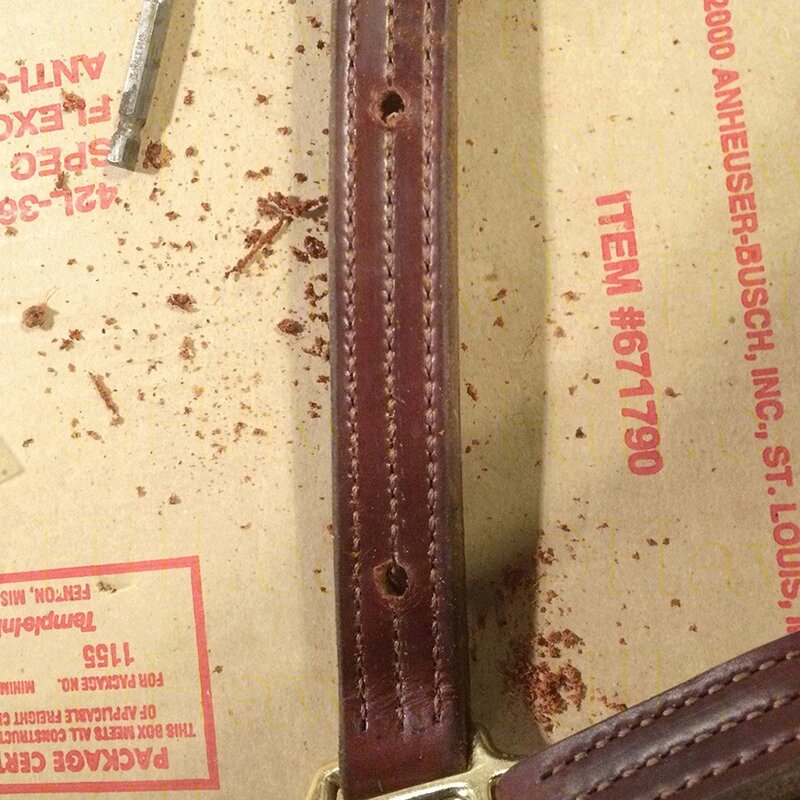 This method can be used to attach plates to nylon halters as well- the only significantly different step is that a heated nail (held with long pliers) is used to punch and seal the holes in the strap. Best tutorial! Now I have the courage to try it for myself. 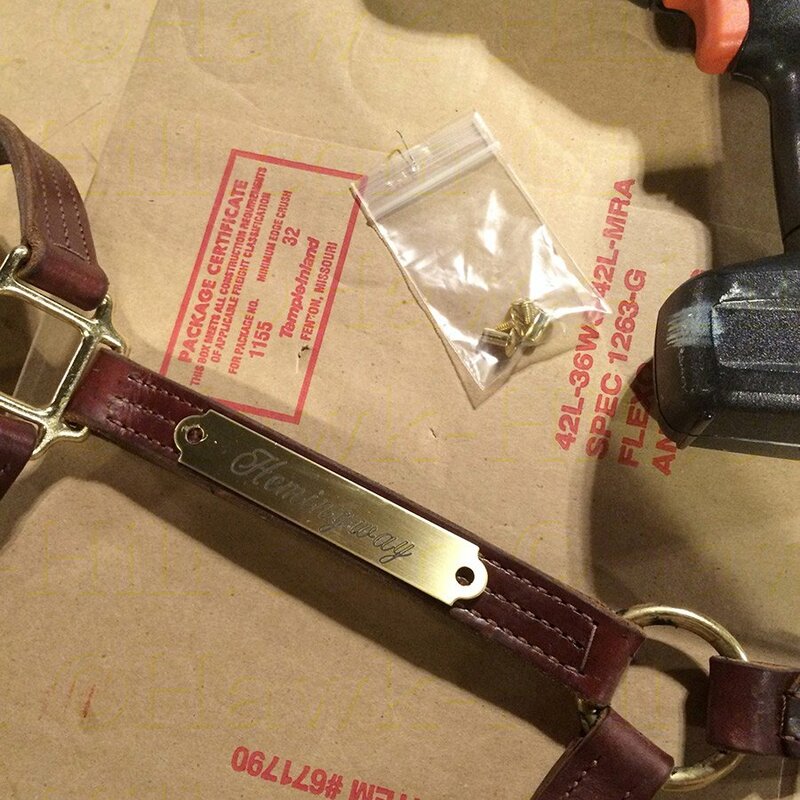 Watch out everyone, my horse will have chicago screws on his name plate soon. Thanks a bunch for posting it!